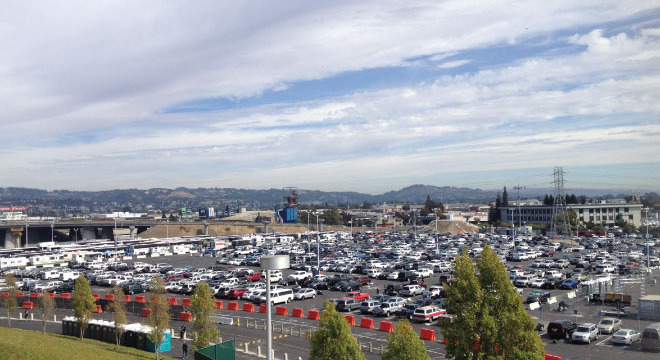 On-site parking is available for all events at the Oracle Arena and Oakland-Alameda County Coliseum including parking accommodations for limousines, buses and RVs. Designated space is provided in all four lots for guests with ADA placards. Parking fees may be paid in cash or with Visa, MasterCard, American Express and Discover Card. All rates include a City of Oakland-imposed parking tax, unless noted otherwise. Parking lot rental opportunities are also available. 844.040. F. For purposes of the California Vehicle Code, all surfaced areas of the parking facility, on which vehicles normally travel to enter and leave parking spaces or the parking facility, shall be considered “highways” as defined in California Vehicle Code Section 360. Parking gates open 2 hours prior to event start time. Arena doors open 1 hour before scheduled event time. Parking gates open 2.5 hours prior to game start for most games. Only pre-paid parking passes will be accepted in our main lots. Due to unprecedented demand, we have SOLD OUT of both parking passes and oversized vehicle parking passes for this Raiders season. There is cash parking available in the Malibu parking lot, which is located beyond the South lot. Parking in this lot is available on a first come first serve basis. Parking gates open 5 hours prior to game time. Stadium gates open 2 hours prior to game time. For limos/buses, please contact the Raiders at 510-864-5000. Parking gates open 2 hours prior to game start. Doors open 1 1/2 hours prior to game start. Tailgating is permitted before events in the Oracle Arena and O.co Coliseum parking lots, however due to the limited number of parking spaces available, only one parking stall per vehicle is allowed. Spaces to accommodate vehicles are restricted to 20 feet long x 8 ft wide. Vehicles larger than 20 feet long x 8 ft wide may be directed to the RV/Bus Lot if space is available and will be charged the oversized rate (with the exception of Raiders Games). Guests may only purchase one (1) parking spot per vehicle. Reserving spaces is not permitted. Law Enforcement and Security staff will patrol the parking lots to enforce the City of Oakland Municipal Codes (8.44.040) as well as Arena conduct policies. All charcoal must be extinguished and disposed of in the provided fireproof containers or taken with you when you leave. Please help keep the lots clean by utilizing garbage bags and garbage cans provided by the facility. No selling of any items permitted. Disabled parking placards may be checked by law enforcement to ensure the person who has been issued the placard by the state is present in the vehicle. Disabled parking placards must be displayed at all times while parked in a designated ADA parking space on property. 844.040 I. No person shall bring, or cause to be brought, for the purposes of sale or barter, or have for sale, or sell or exchange, or offer for sale or exchange any food, drink, service, goods, wares, ticket or merchandise within any portion of the parking facility including the perimeter sidewalk of the complex without first having obtained a city business tax certificate and a permit from the authorized representative. 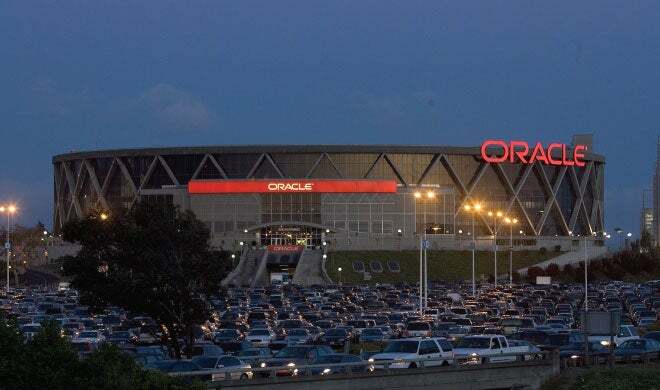 Premium parking services, powered by Propark America, are available for all events at Oracle Arena and Oakland-Alameda County Coliseum. Parking services provided include accommodations for limousines, buses, and RVs, as well as designated ADA-placard spaces in all four (4) surface lots. Acceptable forms of payment for parking fees are cash and/or any debit/credit card with Visa, MasterCard, American Express, and Discover logos. All rates are inclusive of a City of Oakland-imposed parking tax, unless noted otherwise. For more information regarding City of Oakland Municipal Codes, please visit http://bpc.iserver.net/codes/oakland/index.htm.